The MacKenzie Companies are proud to announce that Trish Farrell has been named a Principal of MacKenzie Commercial Real Estate Services, LLC, the company’s brokerage division and is now Senior Vice President/Principal. 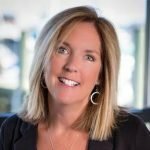 A member of the MacKenzie team for more than 25 years and although currently based in the company’s Annapolis office, Trish specializes in the sale and leasing of commercial real estate across all asset classes throughout the entire Baltimore Washington Corridor. This extensive experience has given her an understanding of both the landlord and tenant perspectives, making her instrumental in building relationships and guiding clients through economic realities resulting in successful real estate decisions. Trish represents companies on local, regional, and national levels and in the past five years has completed transactions totaling nearly one million square feet valued at more than $145 million. She is also actively engaged in helping to build a vibrant entrepreneurial ecosystem and tech hub in the Annapolis/BWI Corridor through her board positions with the Maryland Tech Council and Launch Annapolis. Trish is also an active member of her Annapolis community. As a Senior Vice President/Principal, Trish will provide leadership to members of the brokerage division and work to build the firm’s market presence throughout the Baltimore Washington Corridor, maintaining and promoting the MacKenzie Brand. For more information on Trish Farrell, please visit our team page here.